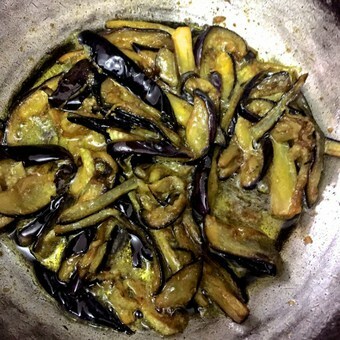 A dish with many names: Chunthi Vanghun, Tschunt Wangun, Bom Chount Wangan – exotic sounding names for this easy and very tasty Kashmiri Green Apple Brinjal Curry. 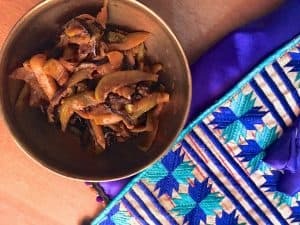 Gets made in no time at all, and the flavours of the tart green apple taken with the mild brinjal makes for a curry different from anything I have made before with brinjal. The theme at the Shhhhh Cooking Secretly Challenge FB Group for Food Bloggers for June 2018, was the cuisine of Jammu and Kashmir. Not having visited this beautiful Indian State, I knew very little about its cuisine. I got myself two lovely cookbooks, which are now the pearls in my cookbook collection: Kashmiri Cuisine – Saffron Plate, A historic perspective, by Nancy Khosa and Kashmiri Cuisine, Koshur Saal – Traditional Quick and Easy Recipes by Chandramukhi Ganju. It was enjoyable to browse these books as well as read online on Kashmir and Jammu, each region with its variety of food and interesting use of ingredients. I now had to decide which of these delectable items to make. 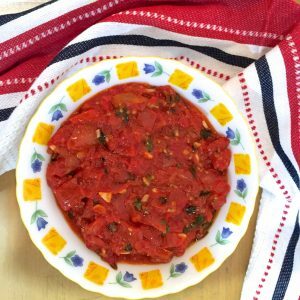 I’m one of the food-blogger members of the Facebook group, Shhhhh Cooking Secretly Challenge and recently we have been making food from the regional cuisine ie of each Indian State. 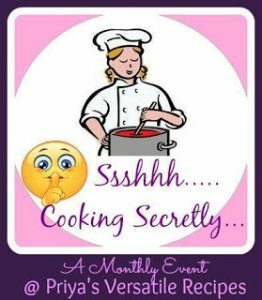 Each of us members is partnered with another and we exchange the names of 2 ingredients to fit in with the theme for the month. We each prepare the dish of our choice and post a picture on the group. The other members try to guess which 2 ingredients were the ‘secret’ ones used in the recipe. My partner for June, the vivacious Renu Agrawal Dongre suggested Lotus stem as one of the ingredients to be used. I was happy with this and planned to make Kamal Kakdi Yakhni Curry. Searching high and low in Bangalore’s markets, however, including Jayanagar’s 4th Block market which usually has every vegetable under the Sun, I could not lay my hands on Lotus stems as the monsoons had set in and these veggies were not available in this season. Back I went to Renuji, and we rethought the ingredients: this time it was apple and fennel. The choice of recipe then became easy as both my cookbooks had a recipe for the Kashmiri Green Apple Brinjal Curry! For Renuji I suggested turmeric and yogurt as her secret ingredients. She has made Kashmiri Dum Aloo, an authentic version of the dish which is spicy and looks delicious, do check it out!. Renuji blogs at Cook with Renu. I enjoy browsing her site with its many recipes – from Indian snacks and traditional desserts such as Dudhi Halwa and Namkeens of various types, Puris and Pakodas to Parathas, Pancakes and Soups. You will find many interesting recipes such as for Zucchini, Brinjal Pancakes and a delicious sounding Hazelnut Chocolate Butter. Tart bright green apples from the nearest fruit stall, and lovely slender purple eggplant from First Agro Farms went into this Kashmiri Green Apple Brinjal Curry. A few condiments, chillies, a little frying, a little sautéing, and my curry was ready! I found Jammu and Kashmir’s food very interesting, perhaps more than any of the Indian States I have been reading about and experimenting with so far. The plan is now to hunt down ingredients and make more of these recipes with the two cookbooks as my guides. So when you want to perk up your brinjal curry a little, try this easy recipe for Kashmiri Green Apple Brinjal Curry. I have had it with rice and a simple dal tadka, as well as rolled up in a roti smeared with a little butter (after ferreting out the chillies of course) and both ways, it tasted so good! Theres something about fried brinjal that I just can’t keep away from though I do try nowadays to reduce fried food..
Easy Kashmiri Green Apple Brinjal Curry or Bom Chount Wangan Sabzi - delicious fried brinjal cooked with green apple spiced with fennel, clove, cumin, chilli and ginger. Brinjal will never be the same again! 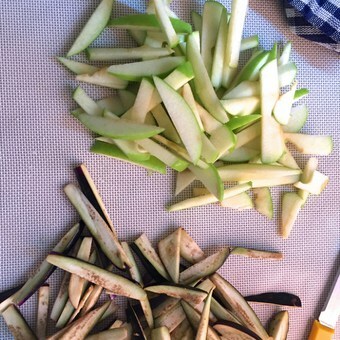 Slice the green apple with its peel on, into long thin slices after removing the core and seeds. You may also slice the apple after frying the brinjal, so that you can cook it before it begins to brown. Top and tail the purple brinjal (remove the stem and slice a little off the bottom) and cut into slices similar to the apples. 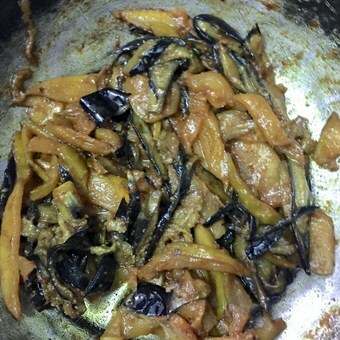 Add half the turmeric powder and half of the fennel powder in the ingredients list, along with a pinch of salt, to the sliced brinjal and mix them in well. The turmeric will stop the brinjal from browning. Heat the oil in a frying pan or kadai and add the brinjal slices with the powders and salt that you mixed with them. If the brinjals are thinly sliced, it would take 5-8 minutes for them to fry till cooked, on medium heat. 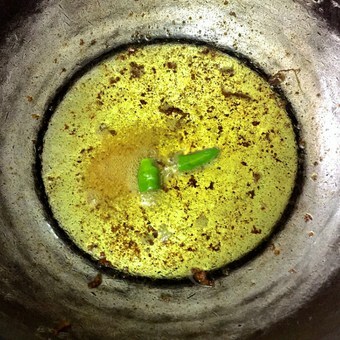 Drain the oil and remove the brinjal from the pan, setting them aside to drain in a colander. 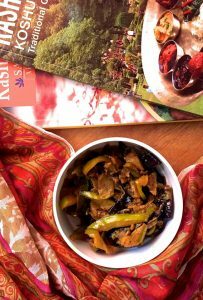 In the same pan and using the left over oil in which the brinjal was fried, add green chillies and then hing/ asafoetida. Sauté for 30 seconds. 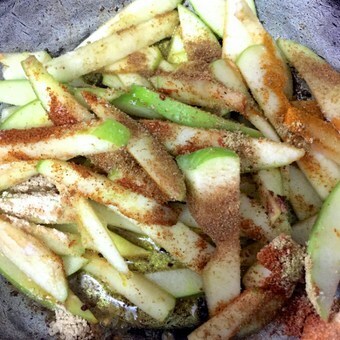 Add the apple slices and all the powders as in the ingredients list - the remaining half of the turmeric and fennel powders, the red chilli powder, the cumin, ginger and clove powders. Add some of the salt, being cautious as the apple will cook down a little. You can check and add more salt if required, in the end. Stir well and sauté on low heat for 10-12 minutes, until the apple is tender. Add the water, stir and cook for about 5 minutes, or till the apple is cooked. Add the fried brinjal and gently stir it in. Check for salt and add more as required. Stir. Turn off the heat and transfer the Kashmiri Green Apple Brinjal Curry to a serving dish (removing it from the hot pan so that it stops cooking). 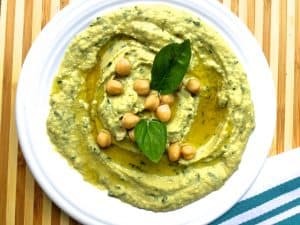 Serve with hot rice or with roti. Apples with brinjals – such a unique combination. Your curry looks so good and I am going to give it a try. I am sure I will enjoy the tanginess of Apples in this. Thank you Anu! It’s tangy and flavourful! 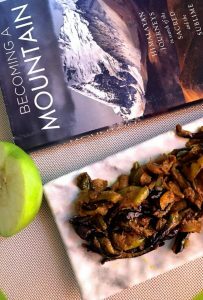 Ever since I’d come across this recipe while trying to discover more about the Kashmiri Cuisine, I’ve wanted to try this unique combination of brinjals and apples. Now I have a recipe to follow. It looks so delicious. Thank you Mayuri. I was surprised at how well the apple and brinjal went together! This is such a unique combination, looks so delicious, must try it sometime. Thank you Jayashree! Do let me know if you try it out! Never thought of green apple and brinjal. Looks so different and so delicious. tart apples and brinjals in a curry..thats really new to me. 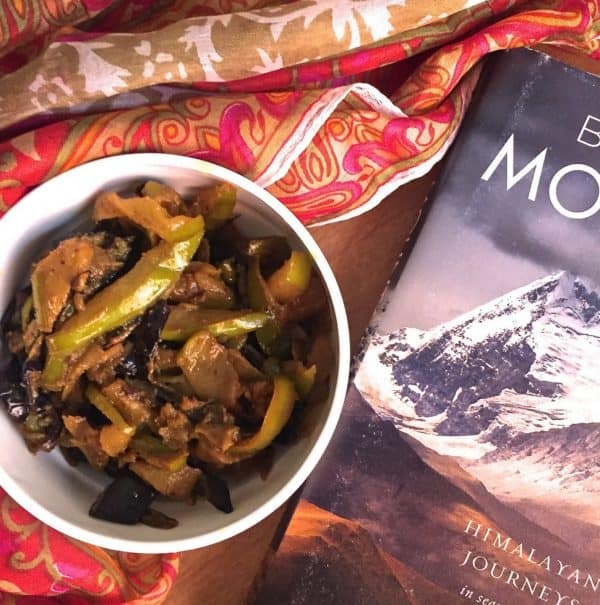 Will def try this recipe soon…do the two books you have mentioned have vegetarian recipes as well?? Never thought of pairing Green Apple and Brinjal in a curry Di ! Interesting share ! Thank you, Poonam! I will be making this Curry often, I think! 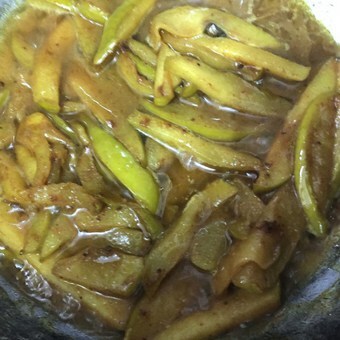 I would have never thought of adding green apple to any curry😋😋 looks delicious. Thank you Avin! It’s great learning about different Indian cuisines and the rich variety they have to offer, isn’t it! A different and unique recipe. Green apple and brinjal never thought of this combo. Great share. Thanks for this wonderful recipe. Thank you so much, Sujata! Green apple and Brinjal curry is completely different and new to me. This sounds superbly delicious. Thanks for the unique recipe. Awesome share. Apple and Brinjal, now that’s a unique combination. I can imagine the tartness of the apple complementing the mellow taste of the brinjal, and giving it a unique twist! Quite an interesting and different curry, never heard about this combination. Seriously you came up with a delicious curry. Thanks for sharing. Please come! We will talk Food and books! Sujatha, I dont know if love your book collection or your recipes more… Coming soon. 😄 Thank you Seema! Do come, I would love to show you the book collection! The apple and brinjal combo is really very different.. must give it a try. looks really tasty. Thank you Shobha! Yes it is tasty! Wow. who would have thought of pairing brinjal and green apple together?! BTW, I picked up some dried apples on our recent holiday in Kashmir – wondering what to do with them. Any ideas? I know, right? So tasty it was! About the dried apples – if they are not very sweet, maybe use them in pasta or risotto instead of sun dried tomatoes. Should give a nice flavour! Let me know if it works!